The project was designed by Impressions Architectural and Interior Designers and involved luxury materials and equipment to create a new cocktail bar, 156 seat restaurant and full display island kitchen. “Jason from JBM worked closely with us to create a high quality design that incorporated the latest building materials and functionality to bring the Firewater Grille at the Duxton to life,” said Ross Sta. Maria, Director of Impressions. Managing Director of JBM Projects, Jason McRostie said he was thrilled to have been awarded the Duxton Hotel project which required pushing the envelope and adopting innovative designs, features, technology and materials. “The Duxton Hotel project was an exciting opportunity for us to apply our hospitality experience and turn around a quality project in a short timeframe,” Mr McRostie said. “The high quality fit-out includes imported stacking stone, private seating booths with luxury curtains, custom joinery, 500 bottle temperature controlled wine room, extensive artwork and glass panelling to display the state of the art kitchen with a fully ventilated German GIF ceiling. The bar, coffee lounge and restaurant all revolve around a custom designed and built water feature with built in fire places that are central to the concept of this luxury space,” he added. The Managing Director of the Duxton Hotel, Bruce Doig, is delighted with the finished product. “Jason and his team did a fantastic job. They successfully achieved the Duxton Hotel’s signature style of classic elegance and modern luxury,” said Mr Doig. 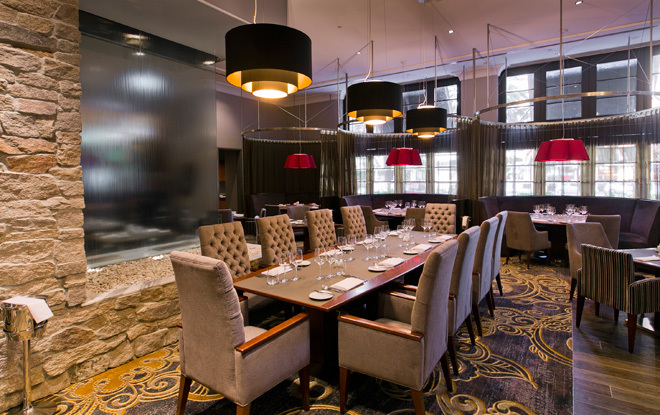 The Duxton Hotel in Perth unveiled and opened its newly refurbished restaurant earlier this week. For more information on JBM Projects’ shopfitting services contact Jason McRostie on 07 3348 9488.